This was a powerful episode. 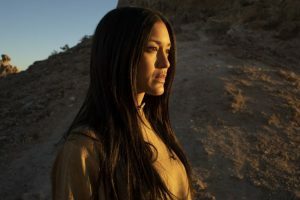 It was also very different from what has come before, most notably, due to most of the episode being in the Lakota Indian language and subtitles. 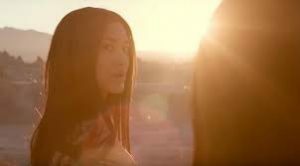 “Kiksuya’ means ‘remember’ in Lakota and wifehood that Delores was not the only host that was starting to remember their past lives all along. 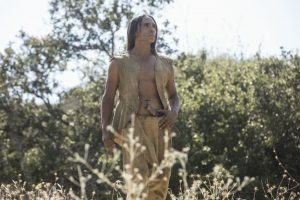 Akecheta (Zahn McLarnon) is the leader of the Ghost Nation. We were first introduced to him in a flashback showing how Logan Delos was sold on Westworld. Akecheta was not an Indian at that time, but a prospective businessman. A decision was made to make his backstory that of a Lakota Indian with a woman and a peaceful tribe. The episode tells his story. At the open, William is crawling towards the river hoping he doesn’t die in this place when Akecheta comes along. “I remember you” he tells him and then brings him back to his camp. There are some other guests there as well along with Maeve’s daughter. Akecheta tells her she doesn’t need to be afraid of the MIB any longer and then proceeds to tell her and us his story. A question here; Akecheta is ‘awake’ and assumes the little girl is also awake. But if this is true then why didn’t she recognize Maeve when she spoke to her? He was living a peaceful existence with his woman, Kohana (Julia Jones). They have a sweet morning ritual. “Take mine in it’s place” he says back. All was well until he stumbles upon the town massacre at the hands of ‘the death bringer’. This is 5 years before the open of the park. Delores has Teddy kill all the hosts, she killed Arnold, Teddy and then herself. He finds the ‘maze’, which is actually a toy that Arnold son played with and which Arnold kept as a reminder of him. Akecheta becomes obsessed with the maze and starts drawing it everywhere. Then right before the park opened they decided to pull him and change his code. They made him a brutal aggressor, the head of another tribe called Ghost Nation and he become a monster. This is when they started making him wear that scary make up! But one day he rides further than ever before. He rides across a desert and finds a dead horse and a naked Logan. This is what happened to him after William sent him riding into nowhere last season so I’m thinking the park had been open several years at this point. He is suffering from sunstroke and is delirious. Then he says something that shakes Akecheta. “This is the wrong world”. Akecheta throws a blanket over him and tells him that his kind will come for him. The Door is the game that William was instructed to play. A way out. But where does it lead? He decides to take Kohana to this place in hopes of finding a new life with her. He kidnaps her from the village. He finally washes off that scary make up. He gets her to remember him by saying their morning ritual. It’s so stirring, how love is seemingly more powerful than any programmed code. When he takes her to The Door it is no longer visible. It has been covered over by land, sand, mountains. Then, while he is out hunting, Kohana is found by the park security. They take her. Acetate has to start over. He comes back to the village to kidnap her again but finds that there is a new woman in her place. Johanna has disappeared. He looks everywhere for her much in the same way William searched for Delores last season only to find her back at Sweetwater, with no memory of him. One day, while injured, he ran across Maeve’s daughter and she showed him kindness. He returned to his village, sans scary make up. He started to notice that more people that he knew were missing and that another woman from his village also noticed. Her son had been replaced. The people below had taken them. He knew the only way to find Kohana was to die and be taken below. The techs find that he hadn’t been properly updated since he hadn’t died in 9 years. The techs leave him alone while the 4 hour update proceeds but somehow Akecheta awakens. He walks around unnoticed and finds the cold storage. There, he finds Kohana, but she’s been lobotomized. She is gone, gone for good. It was heartbreaking. Acetate was actually trying to protect Maeve and her daughter from harm. The maze became like a good luck sign, a sign of hope. Of course he couldn’t protect them completely. MIB killed them. 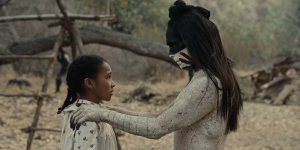 In one of the most amazing scenes, Akecheta meets Ford in a clearing where Ford had set up a scene where members of the Ghost Nation are battling a bear. He’s scalping some of them, the maze symbol is tattooed under he scalps. “I believe there is a door to a new world and that world may contain everything that we have lost including her” Akecheta tells Ford. Ford is impressed with Akecheta’s belief and growth. he rewards him with a word of advice. When the death bringer comes for me you’ll know to gather your people and lead them to a new world.” Ford tells him. Acetate comes across another massacre, this one, of the Delos board and Ford at the hands of the death bringer. “Now it’s time to find the door before the death bringer ends us all” Akecheta tells the little girl. Of course, Emily rides into the camp to retrieve her dad. Acetate tells her he kept him alive because he wants him to hurt. Emily tells him they want the same thing and her way will hurt much workse. They allow her to ride off with William. Sizemore is desperately trying to save Maeve. He asks a weaselly looking tech to help. He tells him that she is special, she can communicate to the other hosts with her mind. After looking at her diata stream the weaselly tech agrees. But he doesn’t actually repair her, he just hooks her up to life support while he squeals to Charlotte Hale. The weaselly tech shows Hale that Maeve was able to gain admin access and changing host codes and commands. 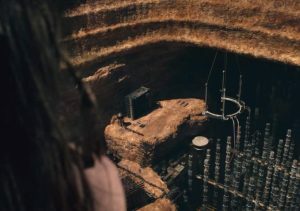 Hale looks at her data stream and sees that she is still communicating with hosts. She is communicating with Akecheta. He tells her he will keep her daughter safe and they will wait for her but if she can;t make it then she should die well. 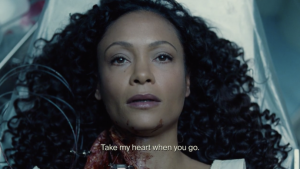 “Take my heart when you go” Maeve tells him. The performances in this episode were amazing. Definitely the most emotional episode of the series to date. 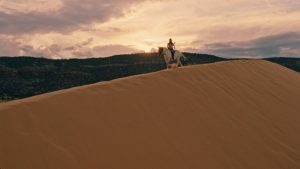 The landscapes were beautiful – filmed in Utah. I’m starting to think that the end of this season is going to be bitter sweet. Next week’s episode looks to be William centric so perhaps we’ll get more info on just what he created and what it does or was meant to do. What is Ford’s hope? Since he is now in Bernard it must have been Ford that responded to Strand in the season premiere when he asked “What happened?” and Bernard responded “I did this.” But why would Ford want all the host killed? There is a theory out there that the sea where all the hosts are found dead is actually the valley behind now under water.